Does this happen in your house? When yet another school vacation looms large on the calendar, do the kids line up to ask the million-dollar question: “Are we going away?” Do their little faces glow with hopeful excitement, as they cross all their fingers and toes, hoping for a yes? Keep reading for a few great ideas to use when the answer unfortunately has to be “Not this time”. If there is a Disney trip anywhere on your distant horizon, you can capitalize on that all year long. Family vacations are a really big deal in our house – they are the frosting on the cake of our lives. And a vacation in Disney World? The crème-de-la-crème of all the frostings on all the cakes! The maps and mementos we bring back hang on our walls, the photo books we create are passed around on holidays, and the stories of our adventures fill our school essays and writing journals throughout the year. Vacations rock! And Disney World is the rockin'est vacation of all. But can we go on vacation every time there is a school break?No. Do we wish we could? Of course! The big people in our home know the importance of being patient and learning to wait for the things we want. The younger set is still working on this. The challenge: how do we teach our children that the anticipation of an event is usually half the fun? The anticipation of the next Disney vacation – or Disney Dreamin’ - is a state of joyful happiness we can appreciate all year long. Here are just a few examples of how to do that. The first thing I did after booking a recent trip to Disney was create a Countdown Chart. We planned our trip a full 8 months before the trip would actually happen. When we made the announcement to the kids, they were ecstatic beyond words – and yet, it was very hard for the younger kids to understand exactly WHEN we were going. Eight months in the future to a young child is a VERY long time, indeed. We told our kids about the trip in December, but before we would be getting on the plane, they would be living through the winter holidays, snowstorms, the first flowers of spring, the end of the school year, summer camp….practically a lifetime for a child. The Countdown Chart made all that waiting part of the fun. The chart was big, fun and colorful, decorated with pictures of our destination and a flip chart of numbers which counted down exactly how many days were left before we would be boarding the plane. Creating the chart was a fun project for the whole family, and it was created with supplies we already had around the house- oak tag, stickers, index cards, ribbon. 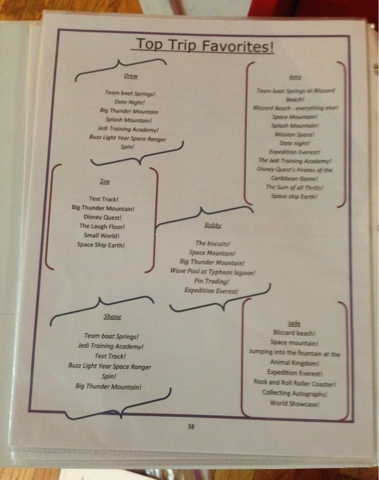 We hung the chart in the kitchen where it was visible to all of us every day at meal time. Flipping the numbers down a notch each morning was an eagerly anticipated job that everyone wanted. An added bonus: the kids were practicing math skills without even realizing it as they converted “176 days” into months and weeks. Next, I created a Fun Folder to hold all the information and plans for the upcoming trip, and I kept it in a central location. I customized our folder with fun pictures of our destination. Inside the folder: brochures, menus, maps, and lists. To keep the excitement building, every once in a while new itemswere added for everyone to look at. Each child got involved in planning the trip by creating a “Fun Request” - a list of the things they personally wanted most to do on the vacation. Each “Fun Request” became a living document, changing throughout the year as new brochures were added or interests changed. We let each child know that we would do our very best to meet everyone’s top two or three requests, within reason, so they were all motivated to research their options. 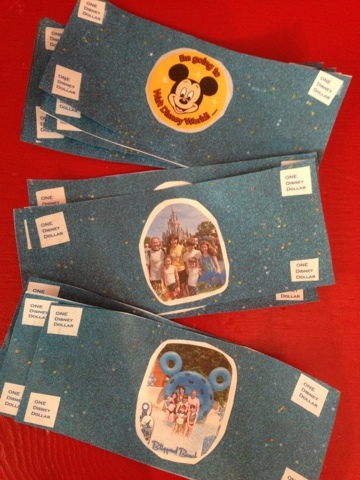 Another way I kept the vacation fresh in everyone’s mind throughout the year and built some excitement was to issue Vacation Vouchers- our family's version of Disney Dollars. I handed out these treats as unexpected rewards for good deeds, as payment for extra chores, and as small birthday or Valentine’s Day gifts. The Vacation Vouchers could be used for souvenir shopping, of course, but also for special perks, such as the privilege of getting to decide where to eat the first night, or getting to decide which park to visit on any given day. Just as anticipation extends the vacation on the front end, sharing your memories afterwards extends the fun on the back end. We kept the fun going by creating a photo book as soon as we got home, and showing everyone who asked (and some who didn’t!). 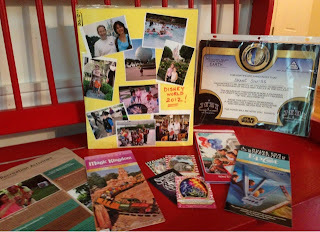 We created a “Favorite Things” list of each person’stop parks, rides, activities and favorite foods. We kept the “Fun Folder” alive by using it to store maps and mementoes, as well as our “Favorite Things” list, which helped spark many lively conversations at family gatherings. So, the next time your kids look up at you with those big, hopeful eyes and want to know why you’re not going away- grab some oak tag and put together a Countdown Chart. 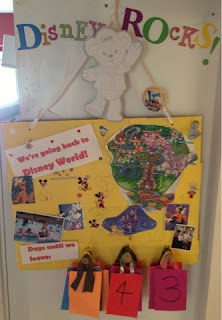 There is ALWAYS a Disney trip somewhere down the road…. Disney Dreamin’ can start happening right now. How fun. I love the Vacation Vouchers idea and see it could provide a bit of fun sibling competition.